ST. JOHNâS, ANTIGUA, Friday 29th September 2017 – LIAT will continue limited operations out of Dominica, Tortola and St. Maarten from Sunday 1st October to Saturday 7th October. Passengers booked on these flights should check-in at least 3 hours before departure. At this time LIAT is unable to carry commercial passengers into Dominica and St.Maarten. 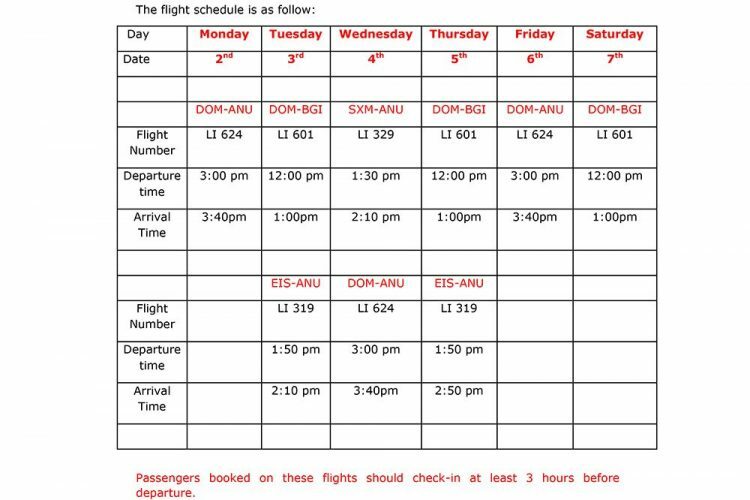 LIAT is now able to take limited passengers into Tortola, B.V.I. To enter Tortola, the passenger must be either a resident or citizen of the British Virgin Islands, holder of a valid work permit or a property owner. Only persons with proof of residency, citizenship or authorisation to enter will be allowed to connect. Passengers for these flights must have a confirmed booking. To book flights or for more information, persons must contact our Reservations Department/Call Centre at 1-888-844-5428 or 1268-480-5601. LIAT will carry only relief supplies as cargo into these destinations. Relief supplies destined to Tortola and Dominica must be addressed to the Government of the BVI and the Commonwealth of Dominica. No personal cargo is being accepted at this time. For further information please contact LIAT Cargo. Please note that all rules relating to the carriage of cargo including dangerous goods must be strictly complied with. The next schedule update for these destinations will be on Sunday 8th October,2017.